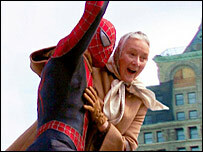 Sky will show live football, Spider-Man 2 and drama 24 in high-definition TV (HDTV) format from 2006. It will make four channels available in the enhanced format - new sports and movie channels plus HD versions of current channels Sky One and Artsworld. HDTV provides a sharper, clearer and more colourful image than the current standard television picture. The BBC is due to begin its HDTV trial broadcasts next year, with series such as Bleak House filmed in the format. Sky already produces its live Premiership football and rugby union coverage in HD format, in preparation for next year's launch. It also plans to show live test and one-day international cricket matches. Quentin Tarantino's Kill Bill: Volume 1 and Tim Burton's Big Fish will be among films shown on its Sky Movies HD channel. US series Bones, Stargate and Stargate Atlantis will also be made available in HD format, as will concert footage including Jimi Hendrix Live at the Isle of Wight Festival. The enhanced HD image is due to the way the picture is filmed, broadcast and displayed on HDTV sets, which use a greater number of pixels to display images than on a standard TV set. A compatible HDTV receiver and TV set are required to view high-definition television. Many HDTV broadcasts will also include a soundtrack which will provide surround sound to viewers using appropriate speakers. Sky has yet to announce a launch date or price for its HDTV service.